Thoroughly research ALL of the startups. Do not dismiss one because you do not plan to offer a term sheet. At the event, you’ll need to perform well in front of all the judges, who will be split into different rooms during due diligence sessions. Fully prepare for due diligence sessions, including a list of questions and a strategy for each entrepreneur. Practice your questions with your teammates. Figure out a system so that you are not stepping all over each other nor shotgunning through a pre-decided list. Judges will want to see you hearing the answers and pivoting on the fly, as you’ll need to do to get the information you need from the founders. Customize the deliverables template and begin filling in some of the blanks so that you can quickly make changes at the event rather than starting from scratch. Create ready-to-go spreadsheets and/or other materials so that your team is prepared to plug in numbers on the fly at the event. You will not have time to create spreadsheets from scratch (e.g., cap tables, exit scenarios, valuation analysis). You are not required to submit these materials, but you may need them to answer judges’ questions, and some teams submit them as appendices to the written deliverables. Be warned that complicated appendices may hurt more than they help, especially if there is ANY mistake in them. Judges are pressed for time, too. Recommended arrival time for traveling teams. Practice your questions with each other in the hotel room. The specific words you use, the tone you adopt, the flow your team achieves…all of these will make a difference in due diligence sessions tomorrow. Try to anticipate some of the answers and be ready with follow-up questions. Don’t ask anything that you should already know! You don’t have time for that. Most MBA events are on Fridays. Most undergraduate events are on Saturdays. You’ll have a chance to check out the facilities, find your study room, connect to the host school’s WiFi and generally get the lay of the land. Arrive on time and go to your study room to continue preparing for due diligence. Organizers will walk through the schedule and take questions. Coffee, bagels and pastries are usually served (check with host). Each startup has 10-12 minutes to pitch. No questions are allowed during the presentations. Slides are not distributed, other than whatever materials were emailed prior to the event. Take good notes and be prepared to ask specific questions during due diligence that follow up on assertions made by the founders. After watching the presentations, each team will have 14-minutes with each entrepreneur. This session is your chance to get any information you need directly from the entrepreneur to make your decision. It is also the first opportunity you have to show off in front of judges, who will only get to score your performance with one entrepreneur (they can only be in one place at a time). Hence, your team needs to be on its game for all Q&A sessions. Think of these deals as having been referred to you by a respected colleague or a limited partner. Even if you know you cannot fund the deal, you will have to explain your decision thoughtfully. Make sure you get the information you need. Don’t just run through a list of questions. The judges want to see that you know what information you need and that you are skilled at getting it. If a founder evades a question, be sure to follow up, but be cognizant of the need to build rapport, especially if you intend to put a term sheet down for this deal. Generally it is better if all teammates participate in the Q&A, though you should come with a strategy that fits your team. For example, if you have a teammate or two who are not great verbal communicators, you might introduce them as analysts who will be taking notes, or figure out some other way to explain the value they are bringing. Who asks the questions? Are we all equally skilled at asking questions? Is there someone who should not ask questions? Who decides which questions to ask? Who decides when we move on to the next question or when we probe further for the information we are seeking? How do we handle talkative or reticent entrepreneurs? How do we create “rapport” with entrepreneurs? What is our technique for getting good answers, not just asking questions? Do we have a tone we’d like to take? Are we friendly? Enthused? Poker-faced? Rushed? Are we united in tone? Good cop, bad cop? How do we balance showing the judges what we know or getting information out of the entrepreneur? Do we pretend that we care about the answers even if we already know we would not invest in this entrepreneur? Should we express our interest or apathy in the deal? Should we try and negotiate preliminary deal terms during the session? Should we use the same strategy with all entrepreneurs or try different techniques? To what level did the team appropriately demonstrate their unique value as an individual VC firm to the entrepreneur? You only have a couple of hours to make strategic investment decisions and finalize deliverables (and eat lunch). The executive summary covers all deals: why you will or will not invest. Make sure it explains your investment decision. Be sure to prioritize bullets to make your analysis clear. Be aware that judges are under extreme time pressure, too, and if you over complicate things, even if it is brilliant, it may distract. You have up to three pages of appendices to further make your point (with graphs, charts, comparables or whatever). Teams are highly encouraged to use the supplied Team Deliverables Template. If you are feeling lost with pre-money valuation and investment size, make sure to watch the training videos and take a look at the VC Razor return analysis worksheet. Judges will receive your deliverables approximately five minutes before you enter the room for your Partner Meeting. Each team sits down with the judging panel around a boardroom table. You have 15 minutes to explain your investment decision to the judges and demonstrate your VC abilities. Judges will have just received your written deliverables. This session simulates an investment committee partner meeting in which junior partners or associates bring in a deal. You have the floor for this 15 minute session, but you should expect to be interrupted. The tone of these meetings is difficult to predict, as the individuals on the judging panel will be different from region to region and from year to year. However, you should expect a tough session, as this is typical of real VC partner meetings, where the goal is to uncover any potential problems with a deal, which can feel like an interrogation for the partner or associate who brought the deal to the table. In other words, partners are often very tough on one another, and that toughness translates into tough meetings for VCIC teams, too. Also be aware that it can be difficult for judges to differentiate between smart, well-prepared teams. One way to do so is to dig deep into some deal terms to see how deep your team’s knowledge goes. This can feel like an unfair focus on a technical nuance but is (arguably) a reasonable strategy to identify the most knowledgeable team. Sometimes, the harshness of the questions is an indication that they think your team is a contender and that they are trying hard to trip you up. Keep in mind that different judges will have different perspectives, and that they don’t all agree on most anything. A tough question from one judge may be irrelevant to another. 3:45 p.m. – Negotiations — dropped from the competition for 2019 regional finals events. After winners are announced, each team gets one-on-one time with each judge. Many students say that this is the best part of the day. We recommend you avoid the temptation to ask “why didn’t we win” and use the discussion as an opportunity to build your network. Ask the VC which deal they would have chosen, how they would have structured the deal, what risks they saw in the deal, etc. If you find a judge who voted your team #1, spend extra time connecting and make sure to get a business card. 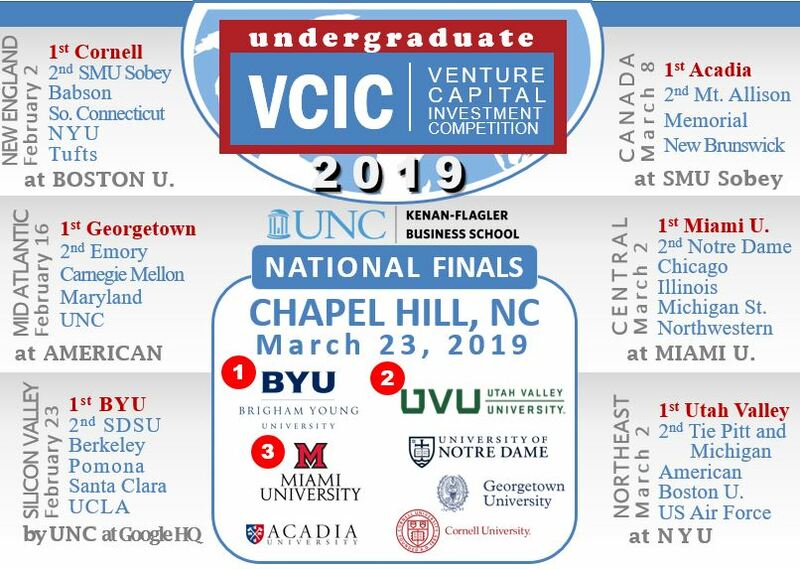 Past participants strongly encourage you to take advantage of this networking session where you will connect with other students who share your interest in venture capital. For those of you who are highly motivated to pursue this career, these contacts you make at VCIC can be invaluable. Recommended departure time for traveling teams.